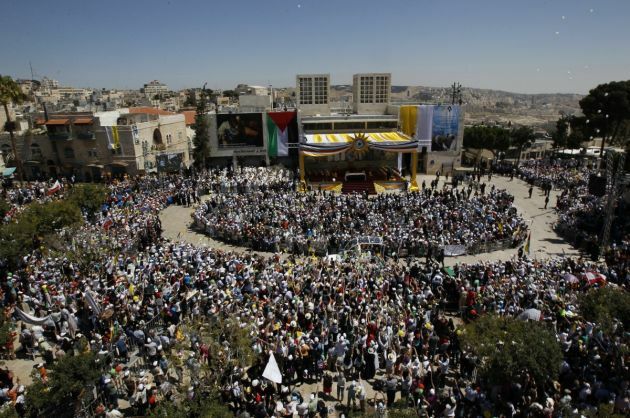 (Photo: REUTERS / Ammar Awad)People gather for an open-air mass led by Pope Francis at Manger Square in the West Bank town of Bethlehem May 25, 2014. Pope Francis made an impassioned plea for peace on a pilgrimage on Sunday to Bethlehem, the traditional birthplace of Jesus, urging an intensified effort to end the Israeli-Palestinian conflict. I thank President Mahmoud Abbas for his kind welcome and I offer cordial greetings to the representatives of the government and the entire Palestinian people. I thank the Lord for the opportunity to be here with you today in the birthplace of Jesus, the Prince of Peace. I thank all of you for your warm reception. For decades the Middle East has known the tragic consequences of a protracted conflict which has inflicted many wounds so difficult to heal. Even in the absence of violence, the climate of instability and a lack of mutual understanding have produced insecurity, the violation of rights, isolation and the flight of entire communities, conflicts, shortages and sufferings of every sort. In expressing my closeness to those who suffer most from this conflict, I wish to state my heartfelt conviction that the time has come to put an end to this situation which has become increasingly unacceptable. For the good of all, there is a need to intensify efforts and initiatives aimed at creating the conditions for a stable peace based on justice, on the recognition of the rights of every individual, and on mutual security. The time has come for everyone to find the courage to be generous and creative in the service of the common good, the courage to forge a peace which rests on the acknowledgment by all of the right of two States to exist and to live in peace and security within internationally recognized borders. To this end, I can only express my profound hope that all will refrain from initiatives and actions which contradict the stated desire to reach a true agreement, and that peace will be pursued with tireless determination and tenacity. Peace will bring countless benefits for the peoples of this region and for the world as a whole. And so it must resolutely be pursued, even if each side has to make certain sacrifices. I pray that the Palestinian and Israeli peoples and their respective leaders will undertake this promising journey of peace with the same courage and steadfastness needed for every journey. Peace in security and mutual trust will become the stable frame of reference for confronting and resolving every other problem, and thus provide an opportunity for a balanced development, one which can serve as a model for other crisis areas. Here I would like to say a word about the active Christian community which contributes significantly to the common good of society, sharing in the joys and sufferings of the whole people. Christians desire to continue in this role as full citizens, along with their fellow citizens, whom they regard as their brothers and sisters. Mr President, you are known as a man of peace and a peacemaker. Our recent meeting in the Vatican and my presence today in Palestine attest to the good relations existing between the Holy See and the State of Palestine. I trust that these relations can further develop for the good of all. In this regard, I express my appreciation for the efforts being made to draft an agreement between the parties regarding various aspects of the life of the Catholic community in this country, with particular attention to religious freedom. Respect for this fundamental human right is, in fact, one of the essential conditions for peace, fraternity and harmony. It tells the world that it is possible and necessary to build harmony and understanding between different cultures and religions. It also testifies to the fact that, since the important things we share are so many, it is possible to find a means of serene, ordered and peaceful coexistence, accepting our differences and rejoicing that, as children of the one God, we are all brothers and sisters. Mr President, dear brothers and sisters gathered here in Bethlehem: may Almighty God bless you, protect you and grant you the wisdom and strength needed to continue courageously along the path to peace, so that swords will be turned into ploughshares and this land will once more flourish in prosperity and concord. Salaam!